DURBAN, South Africa, Dec 12 2011 (IPS) - A new coalition of indigenous peoples and local communities called for a moratorium on Reducing Emissions from Deforestation and Forest Degradation (REDD) programs, a key part of the negotiations for a new international climate treaty that took place over the last two weeks in South Africa. “Indigenous peoples and local forest communities will not place our lives and lands in the hands of corporate polluters,” said Tom Goldtooth, executive director of the Indigenous Environmental Network, based in the United States. Deforestation currently contributes 15 to 20 percent of global emissions of the “greenhouse gases” that cause climate change, such as carbon dioxide (CO2). According to the United Nations, REDD is an effort to create a financial value for the carbon stored in forests, offering incentives for developing countries to reduce emissions from forested lands and invest in low-carbon paths to sustainable development. REDD+ goes beyond deforestation and forest degradation, and includes the role of conservation, sustainable management of forests and enhancement of forest carbon stocks. Carbon Markets – What's In It for the Poor? Sánchez, Goldtooth and many other indigenous and other members of civil society spent the previous two weeks participating in the 17th Conference of the Parties to the United Nations Framework Convention on Climate Change (COP 17), which began in the eastern South African city of Durban on Nov. 28. But as civil society representatives, they are only observers; it is the 193 countries here that negotiate all agreements. The organisers of COP 17 decided to extend the talks for an additional two days, until Dec. 11, in a desperate attempt to make as much progress as possible towards a global agreement to combat climate change. REDD is being promoted as a financial tool that could mobilise 10 to 30 billion dollars annually to protect forests from deforestation, and would be included in the elusive international agreement that will replace or extend the Kyoto Protocol, whose first commitment period ends in 2012. The UN-REDD Programme, created to assist developing countries prepare and implement national REDD+ strategies, has approved a total of 59.3 million dollars for national programs in 14 partner countries. Under the proposed REDD programs, countries and industries looking to reduce their carbon emissions from burning fossil fuels – the main cause of climate change – would pay to protect forests in tropical regions. Trees take carbon out of the atmosphere and sequester or trap it for as long as the trees live. Under REDD, forest owners and communities offer carbon credits on an open market, and a steel, cement or coal-fired power company in the North could purchase those credits instead of reducing its carbon emissions. 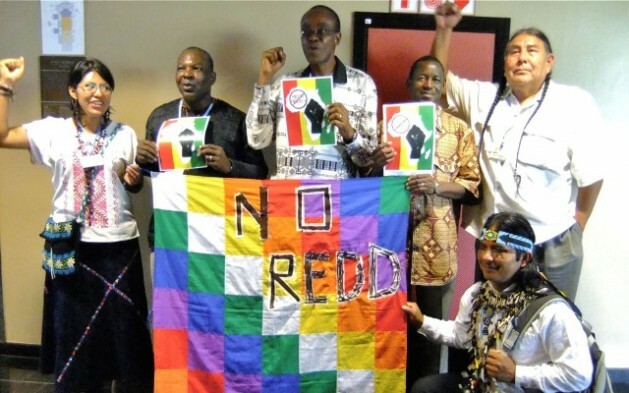 Virtually all countries attending COP 17 want an international agreement on REDD to kick-start a flow of private and public capital they believe will protect forests and biodiversity, reduce carbon emissions and bring money and jobs to local people. Seven Central African countries, seven donor partner countries and the European Commission issued a Joint Declaration of Intent in Durban to underscore the urgency of accelerating the implementation of REDD+ in the Congo Basin, the second largest tropical rainforest in the world. Burundi, Cameroon, the Central African Republic, Chad, the Democratic Republic of Congo, the Republic of Congo and Rwanda pledged their commitment to scaling up REDD+ implementation, with financial support from Australia, Canada, France, Germany, Norway, the United Kingdom and the United States. Henri Djombo, minister of Sustainable Development, Forest Economics and Environment of the Republic of Congo, expressed the hope that “important financial resources” would be made available in early 2012. “Originally, forest incentives only recognised officially registered properties, even though most community and indigenous peoples hold their land under traditional, customary land tenure arrangements,” said Josué Morales, director of the National Forest Institute of Guatemala. The newly proposed mechanism “now clarifies and recognises landholders through all types of law: historical documents, supplementary titles, property, land tenures and indigenous territories. This is very significant for REDD+, which in many countries is challenged because indigenous peoples and forest-dependent communities face insecure land and tenure rights,” added Morales. “REDD will promote plantations, we will lose our access to forests and their foods and medicines, and then we will lose our traditional knowledge,” she said. Land ownership is one factor that makes REDD extremely complex. In addition, it is difficult to measure carbon in forests and determine whether emissions reductions are “real and verifiable.” There is also a widely recognised need to include “safeguards”, or legal requirements that will ensure local people, forests and biodiversity are protected. “Without good safeguards, private investors won’t invest. Without real, measurable and sustained emission reductions, investors won’t invest,” Peg Putt of the non-governmental Ecosystems Climate Alliance told Tierramérica. Putt’s organisation favors REDD+ but wants REDD+ done right, which means very strong safeguards. But countries like Brazil, Indonesia and others have argued against strong safeguards as impractical and expensive. “We aren’t duped by this,” said Marlon Santi, former president of the powerful Confederation of Indigenous Nationalities of Ecuador (CONAIE). “Indigenous peoples have 40 years of experience with big corporations like Texaco, Shell and Rio Tinto, who promised a good life for us and destroyed our lands and communities,” Santi told Tierramérica. But not all indigenous and community groups agree with the REDD moratorium. Some groups, like the Coordinator of Indigenous Organisations of the Amazon River Basin (COICA), still want to explore if there is a way to safeguard REDD and get the revenue, Goldtooth said. “Some others are already participating. But the moratorium was a consensus decision amongst those of us who are here,” he added. Rich countries are pushing hard for REDD in Durban, but there is no carbon market for forests, said Kate Dooley of FERN, an NGO with offices in Belgium and the United Kingdom. The European Union Emissions Trading System (EU ETS) represents 97 percent of the global carbon market, and cannot trade in forest carbon until 2020 by law, she told Tierramérica.